The CESRT experience has been unforgettable for many reasons. Witnessing the desperation of people and the suffering they have endured, are enduring and will endure is heartbreaking. Amongst the suffering however, each person is driven by hope and their will to survive which is truly inspiring. I continue to be inspired and filled with hope amongst what feels like hopelessness at times. The passion and commitment that Toula and each volunteer dedicates continues to motivate me. The support the team gives one another is something special and the endless energy that is put into every aspect of CESRT is highly contagious. I am ever grateful to be a part of this team and to understand the need of each person who arrives in Chios. As painful as it is, at times, it is imperative to be part of this. We arrived two weeks ago to join the CESRT team. The other volunteers welcomed us with open arms, making us immediately feel a part of the CESRT family. And what an impressive family it is! We come from the US, Australia, Scotland, Ireland, Germany, Switzerland, England, Canada and Greece and range in age from 18 to 72. What’s even more impressive is the incredible commitment of all these volunteers who come to work 6 days a week for weeks or months at a time. If that isn’t generous enough, they step up and contribute cash when there is a need for a tent floor or warehouse rent or gravel to fix the camp paths. The hearts of these volunteers are big but the heartbeat of CESRT is Toula, the Greek founder who has been volunteering her time for three years 24/7. 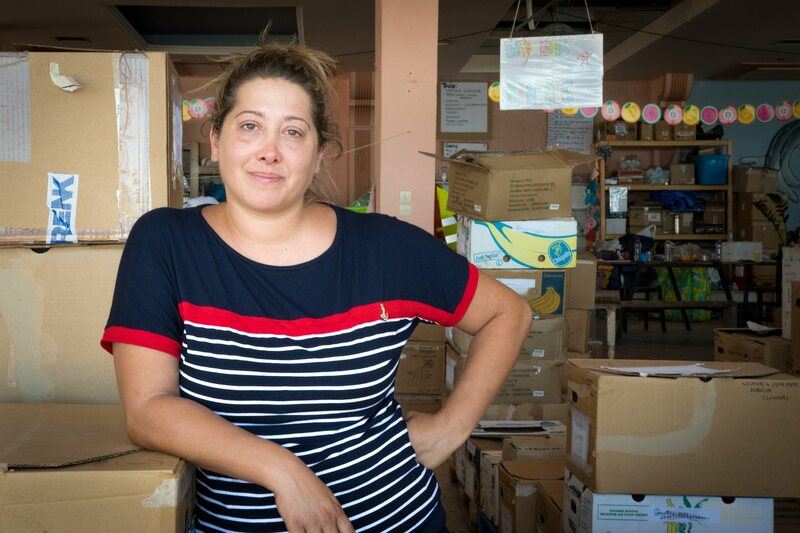 Her passion to help the refugees is infused into everyone around her and the most incredible thing of all is that the organization is so well run with only volunteers, who are constantly coming and going. As Toula says every day “we have amazing volunteers,” and it is because we are led by an amazing woman.